Roast chicken recipe with eight herbs. This is the ultimate golden brown, roast chicken that we all grew to savor its wonderful taste. The herb butter penetrates the meat and does a wonderful task of infusing the bird with its intense flavor. The chicken can be roasted by itself or you can add vegetables for a well rounded meal. You might try bell pepper slices, onion pieces, carrot coins, fennel pieces and other vegetables. Add them to the pan along with the chicken broth. ½ cup plus another 3 tablespoons of eight herb butter. See recipe below. Rinse the chicken and pat dry with paper towels. Season the chicken all over with salt and pepper. Place the chicken on its back. Using a sharp knife make six incisions into the bird: one in the meaty part of each drumstick one at the joints of the thighs and two under the skin of the breasts. Turn the chicken over and make two more incisions, one on the upper part of each thigh going into the back of the chicken. Stuff the cavity of the chicken with the reserved herb stems. Rub the three remaining tablespoons of herb butter all over the outside of the chicken. Using a piece of kitchen string, truss the chicken, beginning at the neck and tying the legs together. Place the chicken in a bowl and cover it. Let the chicken marinate in the fridge for at least four hours or overnight. Preheat the oven to 450 F. Place the chicken on a rack in a roasting pan, breast side up. Roast the chicken for twenty five minutes. Turn the oven down to 300 F and add the chicken broth and wine to the pan. Roast the chicken for another twenty five to thirty minutes. Turn the oven off and let the chicken rest inside for another fifteen to twenty minutes. Remove the chicken from the oven and pour the juices into the bowl. Skin the fat off the juices and reserve them. Carve the chicken into eight pieces. Garnish with the chopped herbs. Serve with the pan juices. 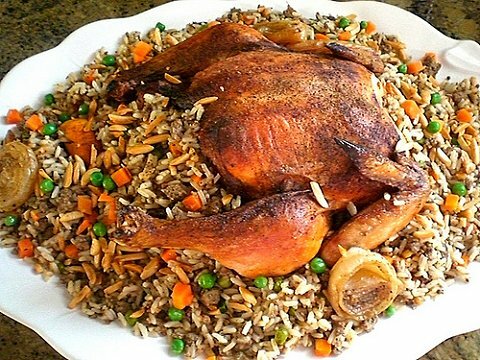 Roast chicken recipe. Extra herb butter can be frozen. It’s also great on pasta, vegetables, leftover chicken sandwiches, or you can save it for the next time you make Roasted Chicken With Eight Herbs. You can use as many different herbs as you wish but you should include rosemary, basil, parsley, tarragon, and thyme. This makes 2 ¼ cups. Place all the ingredients, except for the reserved stems (reserve them for the chicken), in a bowl of a food processor. Process until well blended or mix the ingredients together with a rubber spatula until smooth. Enjoy this delightful roast chicken recipe. Submit your favorite recipe here. Have your own special page. Homemade chicken soup is the perfect warm-me-up on a cold day. We use a recipe for chicken salad to get things started before our dinner. Chicken and noodles are easy to prepare, and so is Asian chicken salad. A couple of recipes you may want to try are barbeque chicken wings and a chicken broccoli casserole.